For those of you shamefully out of the loop (just kidding, I have totally forgot to spread the word on this issue) I am going to India this summer. I am going to be working for Microsoft Research and staying in Bangalore. I am pretty excited, but now also starting to get nervous as the whole thing is coming up pretty quickly. Today I got my VISA in the mail, which is kind of making this all seem a little bit more real. You see, I thought that they were taking care of the whole thing which was not true. There was a little bit of panic when I realized I needed to get a work permit/visa in the 4 weeks before I left, but fortunately those speedsters at the Indian Consulate General, New York got it all taken care of quickly. In fact, from the day that I got it in their hands until the day it was back here it was only like 6 days! Wow! Anyway, someone's at my door, so I'll riff on this whole idea later.... I had a point, I swear. I think Donald Trump is a douche. There, I've said it. I feel better already. Let me be the first to say: Tonight was nutz. Urban Hike Brookline: This Saturday! has tasty vittles with mysterious names. Take 579 south (Liberty Bridge) and continue on West Liberty Avenue. district, Brookline Memorial Park will be on your right. (If you like 51 better than West Liberty Avenue, you can take that too. Continue on 51 south, then take a right on Whited Street. Turn left on Jacob Street. Follow Jacob Street to the right, and you’ll be on Brookline Boulevard. Go north on Washington Road/West Liberty Avenue. Turn left on Whited Street. Or, how about the bus? I am basically out of cellular telephone minutes until May 1st. So that may be a reason why I am not answering your calls. There may be other reasons. As usual, I have a sick ridiculous amount of text messages, so feel free to hit me up. Apparently I also have 1000 picture messages a month which I never use, so that might be another way to inappropriately contact me. As if to make up for the business in other aspects of my life, I have serendipitously found myself invited three different Pirates games within the span of one week! One w/ CMU peeps, one with work peeps, and the other with family peeps. I really love peeps, and baseballs also. Besides, once I get to India it will be all Cricket all the time. I am just starting to realize how much stuff I have to do before I leave in ~3 weeks to go to New York and then to India... In addition to normal stuff like a final project, a final exam and a ton of grading, there are other huge tasks, like for instance moving into a new apartment and showing my parents around Pittsburgh! I told him, "You got to wait!" Ugh, well I definitely overdid it last night. I guess I'll be the last to join the wine tasting blog party. and Mr. Benjamin and others at the other Rob's house for a quick bite to eat before heading over to the the GSA wine tasting. Apparently things had been better before we got there, but the lines were really long. This meant that I immediately began taking two glasses of wine at a time and proceeded to get smashingly drunk. I always get in kind of a weird mood whenever I go to these big all-grad-student events. Partially I really want to meet people from other departments, but at the same time I always sort of feel like everyone is in their own little groups, or something. Honestly, it's really all just me, but for some reason I never end up talking to my friends, and I just sort of wander around for a while... Towards the end I did have more fun though. I ended up finally talking to this girl whom I had seen around and always wanted to talk to. Turns out she was really nice, although I do get the sneaking suspicion that she has a BF. Oh well. had broken my acoustic guitar. I was very sad, until I realized it was all a ruse. Man, this is a long entry... but anyway, I did some work, saw a soccer game, and went to carnival today. the end. Now I will go play my entirely un-destroyed guitar! Just returned from George Fairbanks' PhD defense! I thought it went really well, but currently the important people are deciding how George really did. This event is quite exciting, seeing as George will most likely be the first student to graduate from our program (at least of those who started out in our program). But what's even cooler is that his research is really interesting and (gasp) practical. It's a system for insuring that application developers who are using code frameworks (e.g., Eclipse, MFC, .NET) are actually doing so correctly. It's called Design Fragments, and you can actually download, play with and use the tool circa right now. Actually, the web site seems to be down at the moment, but I'll email George about it. convinced me that I should just go ahead an get it over with, otherwise I'd never do it and this thing would turn into the same thing that all my previous blags have turned into; nothingness. I'll start from the end. I got back from Italy on Monday night. The flight back was absolutely terrible. Not so much during the first 10 hours as in the last 45 minutes. The turbulence was horrible because of all the bad weather that we were having on the east coast. The pilot warned us in advance, but I'm not sure it helped. It was so bad that a large number of people on the flight were taking full advantage of their sick bags. I wasn't, but that doesn't make me cool as I was pretty much terrified the whole time. If you know much about me, you know that this is probably the worst person that this could have happened to. We even had an aborted landing where we pulled up the gear, powered up and went around for another try, all because the winds were above the safety threshold. Blah. I'm just glad it's over, and glad to be back on the ground. 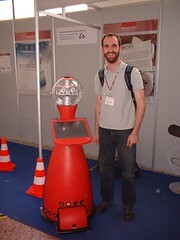 But, the rest of the conference was a lot of fun, as you can tell by this awesome picture of me and a robot. I think we finally taught robots how to be more human, and all we had to do was give them the gift of friendship. It's touching. I had a great time meeting and hanging out with all the other CMU people who were there at the conference but whom I had never met before (it was something like 25, which is crazy for one conference). I got to seem some sites, got to have some drinks, got to eat some great good and I even gave a presentation. I may talk about it more later, but my actual presentation (which took place at a workshop and not the actual conference) went well enough. I think I was reasonably well prepared. Today's Plenary Talk was a surprisingly interesting one. Surprising because the topic was factory automation. It was given by UCBerkeley professor (and former CMU alum) Ken Goldberg. The goal of his talk was to propose ways to make the design of assembly-line machines more algorithmic (Putting the Turing in Manufacturing it was called.). The most interesting piece was some research he did on designing part alignment machines. Apparently getting parts in the right alignment so that they can then be assembled by machines is one of the most time-consuming parts of automated manufacturing. Anyway, there's a Java applet where you can design your own 2D part and it will show you the series of 'grips' needed to put any starting alignment into one unique ending alignment. Check it out. Actually, if you're going to try out this tool (you should cause it's really neat) you should try basic rectangles first, then their whole algorithm will make a lot more sense. It is immediately apparent that I know absolutely nothing about robotics. The idea of me attending this conference is that I will give my presentation at the workshop on Saturday, but also that I will try to pick up on interesting software/development/programming/design type of issues that designers have when they are developing their robots. One thing I have picked up on immediately, though, is that this is definitely a conference for robotic scientists rather than robotic engineers; not to say that no one here has built robots, that is not true, but the types of issues that interest them are not related to building the robots themselves but with the robots' mental models of computation, planning, locomotion, grasping, etc. I didn't expect to go to a conference and pick up on exactly what everyone was talking about, but I do feel a bit out of the loop. Yesterday there was some site-seeing and some very-tiredness. Today, the first day of the conference, I am trying to attend as many potentially interesting talks as I can. PS: A330s rule. Ours had those little TVs in each seat, but apparently now (in the two years since I have traveled across the Atlantic) you can now start your movies whenever you want as well as pause them as they run. This is in contrast to the last personal TVs I used where you could only switch channels, but had to watch whatever movie was on at whatever point in the plot it was at. I saw Stranger Than Fiction, as well as School for Scoundrels. Not half bad. What's the deal with QDoba hot sauce? No seriously. It's not hot. Why do they divide it into mild/medium/hot stratifications if the hot is not actually going to be spicy? Isn't that the whole point of having a stratification in the first place? So that those who are easily offended by black pepper and Altoid mints can choose mild? It seems to be the case that all mainstream Mexican restaurants have this problem. It's really inflation of labeling, much like the grade inflation taking place at our nation's most prestigious ultraversities. Why reward mediocrity, people? They have something called, "ultra hot" or "mega hot" or something equally insulting, and which I refuse to get based in the principle that hot should be hot. I just submitted my paper! I am just about to go to the airport to go to Rome! Good bye C++, hello fashionable Romans! Since I am furiously working on this paper, time for blogging is slim. But Ciera has a new blog up, so that should keep you in the loop. Oh and this weekend was fun, in particular Thursday and Friday nights but maybe you had to live it and words alone aren't enough to convey the emotion or also possibly maybe I am too lazy to convey that emotion. Whoa, check out Scala. It's a programming language, and it's like Java and ML at the same time. // TODO: Where is my auto-gen? You may have noticed the new title of this page. Furthermore, you can now reach this site via my new domain name, www.blogface.org. To be spit over a sample of The White Stripe's, "My Doorbell." I drink Capri Sun, Tang, and Coffee makes me wildish. Walk the streets of Pittsburgh, get 'caught in a drive-by. It's fifth-grade drama and the wordplay is juvinille. I just found out some good news today. Aparently the project that I am going to be working on over the summer is implemented in F#. For those of you who don't know, F# is basically OCaml, but it runs on .NET bytecode (or whatever they call it. MSIL?) and uses the .NET libraries instead of the OCaml ones. This is a huge relief, since I've been working on C++ for the past 2.5 months, and am really starting to get tired of it. Word. SIGBOVIK, the fake conference by and for nerds was, by all accounts a raging success. Check out the presentation I gave, as well as the paper it's based on. Way to go everyone!